Chemical wastewater streams may contain toxic compounds which are non-biodegradable, and therefore require advanced treatment techniques such as adsorption. However, application of adsorption processes is often limited by the cost of adsorbents. In this study, the adsorption capacity of a low-cost adsorbent (pine sawdust) was investigated by treating wastewater containing nickel (II) and other heavy metal ions. Results were analysed using response surface methodology and a factorial design was employed to determine the interactive effects of the various factors on the adsorption capacity. Furthermore, Langmuir and Freundlich adsorption isotherms were fitted to experimental data to characterise the adsorption of the nickel ions by the pine sawdust. As a result, the highest adsorption capacity was attained at the combined effect of low adsorbent dose, high pH and high initial concentration. On the other hand, the Freundlich isotherm fitted the experimental data better than the Langmuir isotherm. Results of this study indicate that the use of pine sawdust could be a promising solution to the elimination of nickel ions from multi-component aqueous solutions. A vast number of raw materials for industrial processes originate from agricultural activities, which result in the production of chemical and solid wastes. The chemical wastes arise from the use of pesticides, dyes and fertilisers while the solid wastes include bagasse, sawdust, rice husk, peanut shell and coffee husk, among others. Interestingly, the agricultural solid wastes can be converted to adsorption media and used to treat the chemical wastes; a concept of using waste to treat waste. By this concept, the cost of adsorption material for wastewater treatment, which is a major constraint in wastewater management, is generally reduced. Due to environmental concerns and the demand for high-quality water, there has been an increase in regulations controlling the discharge of heavy metals and non-biodegradable toxic compounds into water bodies. This has resulted in developing toxic waste removal techniques such that only minute quantities remain in the wastewater discharged into water bodies. Secondary wastewater treatment is not completely adequate in removing toxic material and thus advanced methods have become necessary. Secondary methods are employed in conjunction with advanced methods to separate the recalcitrant organic compounds and non-biodegradable inorganic compounds (Singh et al., 2007). Advanced methods of removing toxic compounds from wastewater include membrane separation (Mavrov et al., 2006), ion exchange (Cavaco et al., 2007), lime precipitation (Zhang et al., 2007), neutralisation, metal hydroxide precipitation (Ayyappan et al., 2003), electrolytic methods (Kurt et al., 2007) and adsorption (Dean et al., 1972). However, these processes are costly (Dae and Young, 2005); in particular, the use of activated carbon and ion exchange resins is not suitable for developing countries due to their high capital and operational costs (Raji and Anirudhan, 1997). Adsorption has gained a relatively wide application due to the fact that there are several types of adsorbents that are commonly used, which includes clay, activated carbon, zeolite and silica gel and the agricultural adsorbents such as coffee husk (Kumar, 2006), peanut shells (Wafwoyo et al., 1999), bagasse (Azhar et al., 2005), rice husk (Kumar and Bandyopadhyay, 2006) and sawdust (Argun et al., 2007). Thus, by using natural, abundant, cheap agricultural wastes (Taty-Costodes et al., 2003), the adsorption of pollutants from aqueous solutions can be much more economical with regard to other similar physicochemical processes (Mahvi, 2008). The concept of using waste has not been investigated in detail. To the best of our knowledge, no work has been reported on the use of pine sawdust in the removal of nickel (II) ions from multi-component aqueous solutions using the response surface methodological approach; many researchers use the one-factor-at-a-time (OFAT) method. However, this method is extremely time consuming and expensive since it requires a large number of experiments (Elibol, 2002). The aim of this study was to investigate the interactive effects of operating parameters such as adsorbent dose, pH and initial concentration on adsorption capacity of pine sawdust towards nickel (II) ions using the response surface methodology (RSM). Furthermore, the adsorption capacity of pine sawdust in the removal of nickel (II) ions from multi-component aqueous solutions was determined. Pine sawdust collected from a local company was ground and sieved to a particle size range of 500-850 µm. It was then placed in stainless steel trays and dried in an oven (EcoTherm) at 50ºC for 24 h. A mass of 100 g was placed in a 1 ℓ glass beaker and 660 mℓ of 0.6 M citric acid solution was added. The mixture was manually stirred for 30 min, and then separated by vacuum filtration. The wet sawdust was then spread in stainless steel trays and dried in an oven at 50ºC for 24 h and then the temperature was raised to 120ºC and maintained for 90 min. The sawdust was allowed to cool and washed 5 times using hot distilled water (60-80ºC) and then dried at 50ºC for 24 h (Wafwoyo et al., 1999). Finally, the temperature was raised to 250ºC and maintained for 24 h, after which the sawdust particles were removed from the stainless steel trays and stored for adsorption tests. No leaching experiments were carried out to check for the presence of toxic soluble leachate, which could possibly emanate from pine sawdust especially when its source has been previously treated with pesticides. 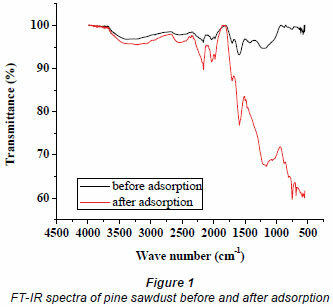 Fourier Transform Infrared (FT-IR) spectra of the pine sawdust before and after adsorption were recorded in the range 500 to 4 000 cm-1 on an FT-IR (Bruker, Tensor 27 TPR) system, to explore the number and positions of the functional groups responsible for adsorption. The stock solutions (1 000 mg/ℓ) of Ni(II), Co(II) and Fe(III) prepared from the metal nitrates were diluted with distilled water to obtain the desired initial concentrations according to the levels specified in Table 1. The zero level concentration of heavy metals was 10 times that reported by Patel and Mudamwar (2002) for a particular petrochemical wastewater sample. Thus, the medium values in the reported ranges were multiplied by 10 and taken as the zero levels in the present study. Additionally, the composition and concentrations of the synthetic aqueous solutions prepared fall within the range of the typical petrochemical wastewater described in the Pollution Prevention and Abatement Handbook (World Bank Group, 2008), which specifies a heavy metal concentration range of 0.1 to 100 mg/ℓ. The pH of the solutions was adjusted using either dilute HNO3 or NaOH. A high (+) pH level of 3.9, which is below the pH point of precipitation (pHppt) for each of the metal hydroxides, was chosen to prevent possible precipitation (Al-Degs et al., 2006). All the pH measurements were done using a pH meter (LabX Direct-SevenMulti, Mettler Toledo) and all the chemicals used were of analytical grade, supplied by Merck Chemical Company (South Africa). ∆X, step change value (Elibol, 2002) of which the values for dose, pH and initial concentration (C o) in this case are 2.0, 1.3 and 0.88, respectively. 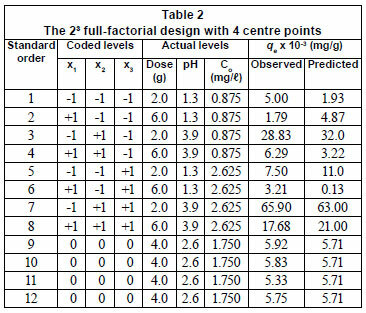 Table 1 gives the range and the levels of the variables (low and high) investigated in this study. Y is the response predicted by the model, whilst x1, x2, x3 are the coded forms of dose, pH and initial concentration, respectively. The term β0 is the offset term, β1, β2 and β3 are linear terms, β11, β22 and β33 are the quadratic terms whilst β12, β13 and β23 are the interaction terms (Bhatia et al., 2009). The analysis of variance (ANOVA) for the quadratic model was carried out to establish its statistical significance at 5% level of significance (95% confidence level). Design Expert Version 6.0.6 (Stat Ease, Inc., Minneapolis, USA) and Matlab Version 7.0.1 software were used for regression and graphical analysis of the data obtained. The statistical significance of the regression coefficients was determined by the Student's t-test and p-values. m is a known mass of adsorbent (g). C e is the supernatant equilibrium concentration of the system (mg/ℓ) (Febrianto et al., 2009). n is the heterogeneity coefficient (dimensionless). Citric acid provides additional carboxyl groups to those on pine sawdust surfaces and substantially increases its metal uptake (Mcsweeny et al., 2006). The spectra shown in Fig. 1 display a number of absorption peaks, indicating the complex nature of the surfaces of pine sawdust. The peak at 3381.2 cm-1 before adsorption can be attributed to the hydrogen-bonded OH group of alcohols and phenols (Yang and Lua, 2003) and it shifted to 3217.2 cm-1 after adsorption. Also, the peak at 1184.3 cm-1 before sorption is associated with C-O stretching vibrations in carboxylic acids (Pavia et al., 1987), and it shifted to 1163.1 cm-1 after adsorption. These major shifts in band suggest that the alcohols/phenols and carboxylic acid groups were involved in metal binding. Agricultural biomasses mainly consist of lignin, cellulose, hemicelluloses and some proteins which make them effective adsorbents for heavy metal cations (Garg et al., 2008). In addition, the band at 1 597.0 cm-1 represents the C=C skeletal stretch in condensed aromatic system and a peak at 754.2.3 cm-1 can be assigned to the out-of-plane C-H bending modes of an aromatic compound (Al-Qodah and Shawabkah, 2009). x1, x2, x3 are the coded values of the test variables, dose (g), pH and initial concentration (mg/ℓ), respectively. The statistical significance of the second-order model equation was evaluated by the F-test and the analysis of variance (ANOVA), which is summarised in Table 4. In this work, the model acceptance was based on the 95% confidence level. In order for a term to be significant at this confidence level, the calculated probability should be lower than 0.05 (Bhatia et al., 2009). The ANOVA revealed that this regression model is statistically significant, as is evident from the Fisher's F-test with a very low probability value (<0.0033) i.e the associated Prob.> F value for the model is lower than 0.05. The lack-of-fit measures the failure of the model to represent data in the experimental domain at points which are not included in the regression. The associated Prob.> F for the lack-of-fit is 0.0515 which is greater than 0.05 and this indicates that the lack-of fit is not significant. Thus, the non-significant value of lack of fit (>0.05) reveals that the quadratic model is statistically significant (Sharma et al., 2009). A standard deviation of 4.35 x 10-3and a relatively lower value of the coefficient of variation (CV=32.9%) indicates a better precision and reliability of the experiments carried out. The model presented a relatively high R2 value (0.9792) explaining 97.9% of the variables; dose, pH and initial concentration in the response and it indicates that 2.1% of the total variation is not explained by the model. Equation (7) was then used to plot the 3-dimensional surfaces of dose pH at constant Co, (Fig. 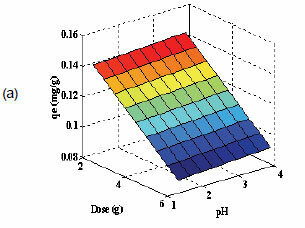 2a), dose Co at constant pH (Fig. 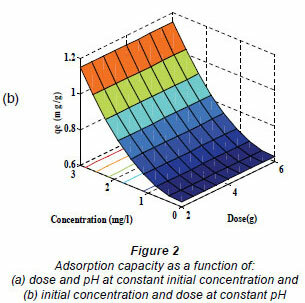 2b) and pH Co at constant dose (figure not shown) as a function of adsorption capacity. No curvature is displayed in Fig. 2a since Co was kept constant, and as a result there were no second-order terms in Eq. (7). Low doses resulted in high adsorption capacities (qe), whilst high doses resulted in low qe values (Fig. 2a). At the same time, the adsorption capacity slightly increased with increase in solution pH. Thus, the removal of nickel increases with increasing pH and decreasing dose. This trend predicted by the model is consistent with the experimental results shown in Table 2, in which the highest adsorption capacity of 65.9 x 10-3 mg/g was observed at low dose and high pH. It can be assumed from these results and the FT-IR spectra that the possible adsorption mechanism is probably due to ion exchange. High concentrations of H+ ions at low pH of 1.3 may change the direction of reversible ion exchange equilibrium back to starting materials to give low qe values (Yu et al., 2001). At a high pH of 3.9, relatively low concentration of H+ ions means less competition for the adsorption site on sawdust particles, which results in high qe values for nickel ions. The FT-IR spectra showed that the -OH and -COOH groups took part in the sorption process. However the sites responsible for the sorption process might not be exclusively due to the -OH and -COOH groups; other sites on the adsorbent may also contribute to the sorption process and physical adsorption is quite probable (Yu et al., 2001). The decrease in adsorption capacity with increase in dose (Fig. 2a) could be due to the aggregation or overlapping of adsorption sites caused by overcrowding of the sawdust particles). Such aggregation would lead to decrease in total surface area of the sorbent and an increase in diffusional path length (Shukla et al., 2002). This trend is comparable to that reported by Ayyappan et al. (2003) for the removal of Pb(II) from aqueous solution using a low-cost adsorbent. Figure 2b shows that the sorption capacity of sawdust for nickel ions increased with increasing initial concentration. This trend can be explained by the fact that initial concentration provides a significant driving force of the concentration gradient to overcome all the mass transfer resistance between the solid and aqueous phase. This is in agreement with the findings of Ghorbani et al. (2008). The highest adsorption capacity obtained for nickel was 65.9 x 10-3mg/g at low dose, high initial concentration and high pH. 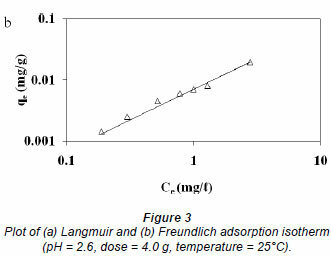 The adsorption data was correlated with commonly-used adsorption isotherms, namely; Langmuir and Freundlich models. The Langmuir isotherm was obtained by plotting 1/qe versus 1/Ce (Fig. 3a) whilst the Freundlich isotherm was obtained by plotting qe versus Ce on a logarithmic scale (Fig. 3b) and the constants obtained along with the correlation coefficients; R2 values are shown in Table 4. The Freundlich model presented a high correlation coefficient (R2 = 0.9844) as compared to that obtained for the Langmuir model (0.9110). Thus, it is evident that the equilibrium data conforms to the Freundlich model, which assumes heterogeneity in the surface binding process. This observation is consistent with the heterogeneous nature of pine sawdust which consists of different active sites such as -OH and -COOH groups as revealed by the FT-Ir spectra (Fig. 1). The Langmuir model assumes homogeneity (i.e., all the active sites possess equal affinity) in the surface binding process and that is why it could not fit well to the experimental data. Agricultural adsorbents display heterogeneity (Gupta and Ali, 2004). This observation was also reported by Fritz and Schlűnder (1981). The intensity of adsorption, 1/n, lies between 0 and 1, which implies stronger interaction between the pine sawdust and the nickel (II) ions (Site, 2001). Disposal of pine sawdust after use can be accomplished by either composting or incineration (Marshall and Johns, 1996) and the metal residues could be recovered by subsequent treatment of the post-combustion ash (Wase and Forster, 1997). Pine sawdust has been successfully used to remove nickel (II) ions from multi-component aqueous solutions. Assessment of the interactive effects of process variables (dose, pH and initial concentration) revealed that the system was sensitive to the tested process variables and the process was technically feasible. 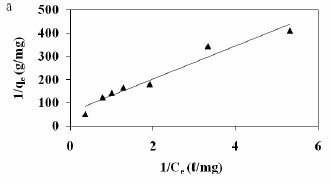 A combination of low adsorbent dose (2 g), high initial concentration (2.625 mg/ℓ) and high pH (3.9) resulted in the highest adsorption capacity of 65.9 x 10-3mg/g. Fitting the experimental data to a second-order response surface model resulted in the model slightly over-predicting the adsorption capacities. Moreover, the adsorption process was better described by the Freundlich isotherm than the Langmuir model. Thus, the Freundlich isotherm can be used as a predictive tool. Further studies need to be carried out to investigate the effects of metal ion interaction during adsorption. In this study pine sawdust, a natural, abundant and low-cost adsorbent has shown adsorption capabilities for nickel (II) ions; hence, it could be an option in the quest to use waste to treat wastewater. Received 26 November 2009; accepted in revised form 8 November 2010.